After you connect the OC1 to DCC power and the track segments, you remove everything from the track and press the button (see operations section for details). This measures the current when the track is unoccupied and saves these value for each segment in the digital memory of the processor. During normal operation, the saved zero levels are subtracted from live readings before determining whether a segment is occupied. This greatly reduces false readings due to leakage and capacitive coupling such as from twisted pair wires. Adjustable from 1/4 milliamp (mA) to 3 3/4 mA in 1/4 mA steps. For reference, a single 10 kΩ resistor accross the track draws from about 1 mA to over 2 mA depending on the DCC voltage. The unit can be configured to hold all occupied indications for at least 2 seconds, or to make the outputs immediate. 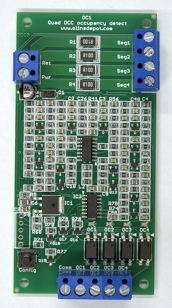 The outputs are completely isolated from the DCC power via opto-couplers. The electronic sensors drop only 400 mV at full current and less at lower current. Easy connection of up to 12AWG wire for power inputs, block detection inputs, indicator outputs.